As a horse owner you have likely spent a lot of time sloshing around in a paddock while trying to catch a horse. A beautiful palomino horse may turn into the color of strong coffee after such an exercise. You then have a choice between two fun parts, the muddy paddock and the filthy horse. For a horse, mud can be an unhealthy environment. Bacteria and fungi are harbored in mud which can cause abscesses, scratches, rain scald and thrush. Insects such as mosquitoes and flies also breed in mud. Dirt of sand particles can be ingested by horses that are fed on muddy ground which can lead to sand colic. Injuries to the horse and humans can result from the slick, unsafe footing that is caused by mud. and ponds. This is not only a concern for those who live near creeks or lakes since the nutrients and sediments can also cause issues with groundwater and this can be a big problem if you draw from a well. An increase of surface water is a recipe for creating mud such as rain off the roof of the barn or any runoff from the driveway. If you barn is in a place where the soil doesn’t drain very well then you are going to have highly organic soil. Manure that is built up from decomposed organic material such as stall waste, shavings or spent hay are also added to the mix. Then there are the added issues of where it is such as the high traffic areas in front of a stall, on top of a compacted and impervious surface such as in front of a gate. All this can bring about mud. However, there are several options to fight against mud. The first step is to make sure horses are fenced out of creeks, wetlands and lakes. You can provide your livestock with easy, cost-effective watering systems while protecting any open bodies of water. It is important to always make sure you practice good pasture management. The golden rule of pasture management in the summer is to not graze below three or four inches. Important components of good pasture management are cross fencing and controlled grazing. Techniques such as a fenced “sacrifice area” where you place your horses during saturated soils and frozen pastures is important for winter pasture management. The health of next summer’s pasture relies on keeping horses off frozen or soggy pastures and allows you to avoid the muddy mess between times. Every few days you should pick up the manure in the paddocks and the sacrifice area. This not only decreases the build-up of mud but it will also reduce the chance of parasite re-infestation. Picking up stray clumps of bedding and leftover hay is also a good idea. Eventually all organic material will decompose and lead to mud. To divert rainwater away from confinement areas you should install gutters and downspouts on all buildings. A two-stall run-in shed can have as much as fourteen gallons of rainwater run off in a year. The amount of mud will be greatly reduced if you divert that much water away from the paddock and you will help the environment by keeping clean rainwater clean. Rainwater should be diverted to grassy ditches, dry wells, rain barrels, stock watering tanks, ponds, well-vegetated woods or to any unused portions of pasture. To keep horses off the dirt and allow the rainwater to percolate you should use footing in paddocks and high traffic areas. Chipped wood products, gravel/crushed rock, or sadness at least three inches of footing in your paddock are popular choices. To see what products are available and what others have used successfully you should check your local stores. Consider laying down filter fabric before installing footing material if you have soil that is very organic and mucky. A woven plastic used in construction projects that has small holes in the material will allow water, but not sand or silt, to pass through. Your local conservation district, the Natural Resources Conservation Service, the Cooperative Extension Office or the web can be used to help with design. You manure pile should always have a tarp. The compost will retain the nutrients you are trying to save and won’t get into the surface waters where they cause problems. 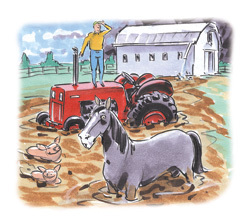 Manure should be stored as far away from streams, ditches or wetlands as possible so that you can avoid mud problems and any potential environmental impacts. Native trees and shrubs should be planted and maintained. 100 to 250 gallons of water per day can be absorbed by a mature Douglas fir. Evergreens will also use water in the winter when other deciduous trees are dormant. Along the outside of paddocks you should use water-loving native shrubs so that you can keep the area drier and reduce the amount of runoff. You should protect the trees in pasture and paddocks from chewing and root compaction. Read the next horse care article on Keeping Owners Safe: Equine Safety Tips.